Partick Thistle's Scottish Premiership match against Motherwell has been called off due to a waterlogged pitch. 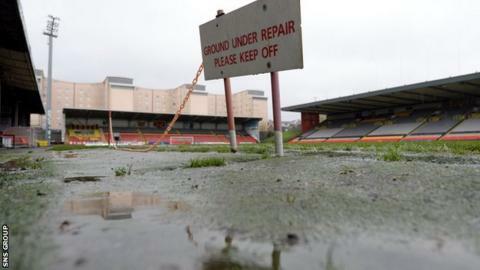 An inspection took place at Firhill at 09:15 GMT following heavy overnight rain in Glasgow. "Please retain all tickets and a rescheduled date will be announced as soon as possible," Thistle said on their website. Celtic v Hamilton Academical and Hearts v Inverness CT have also falled victim to the weather.